The Newby Landfill is one of the largest active dumps on the shores of the bay. It is the terminus for waste for all of San Jose, Milpitas and other cities. The 342 acre pile is still at least 30 feet from its permitted height of 120 feet, and has decades to go before it is scheduled to close. 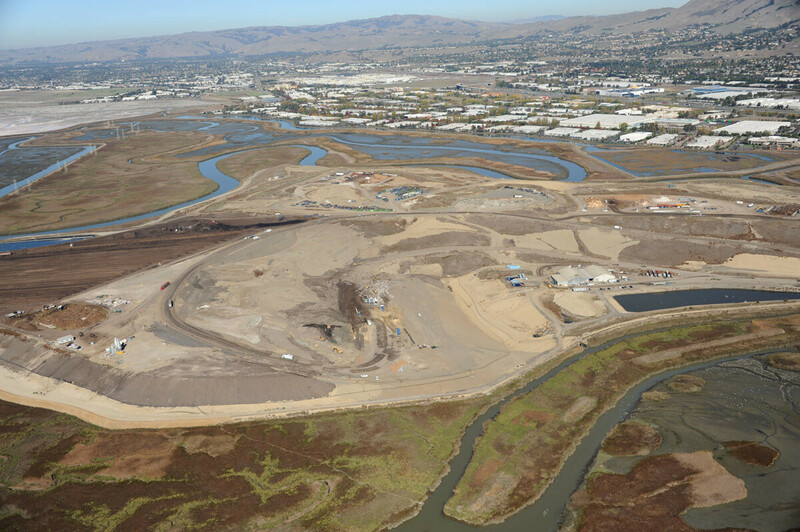 The landfill is an island surrounded by a levee which keeps its runoff from directly entering the bay, and the water that drains from it is treated in the dump's own treatment plant. Electricity for the dump is generated by burning the methane collected from the decomposition of the waste. Dried sewage sludge from the nearby San Jose Treatment Plant is the material used as cover, mixed in with the trash, blending San Jose's waste streams. It is operated by Browning-Ferris Industries (BFI), a subsidiary of Allied Waste Industries, Inc. (owned in turn by Republic Services Group), which along with Waste Management Incorporated, transports and disposes of most of the household trash in the United States. In 2015, state and local authorities agreed to Republic Services request to increase the capacity of the landfill by around 15.1 million cubic yards, via extending the height by 95 feet. This would have the effect of extending the current closure date from 2025 to 2041.